This was an interesting depot arrangement, situated upon a long thin site positioned immediately adjacent to the incline linking the London Bridge and Blackfriars lines. It formed part of the then newly created SE&CR Joint Managing Committee’s London Bridge area improvements. This had included the widening of the original London & Greenwich viaduct to the east of the terminus, which provided an additional two running lines and saw the abolition of the unique right-hand running on the Greenwich line. Terminating platforms at London Bridge were increased by four, by transferring the continental freight depot from here to a purpose-built facility at Southwark, upon a brick-built platform, level with the top of the viaduct. 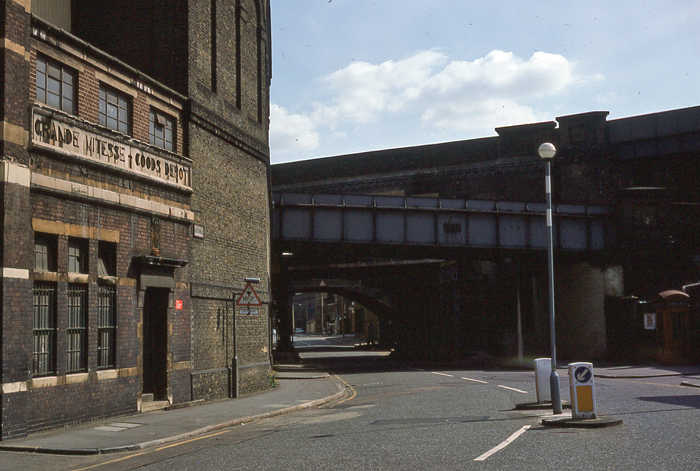 Situated immediately north of the ascending Blackfriars tracks, Southwark Continental Freight Depot essentially comprised a wide platform surface of two faces, serving eastward-facing terminating tracks. The platform was provided with a pitched roof canopy, and the depot’s entry lines were controlled by a signal box positioned at the eastern end of the platform surface. Incorporated into the depot’s site was a locomotive stabling point, which included a 54-foot 10-inch turntable flanked by a 30-foot long water tank, a coal stage, and a coaling crane. Thus, the facilities on offer here were those typically found at a motive power depot although, of course, there was an absence of any form of shed building. Despite being situated upon what was virtually the same site as the freight depot, the locomotive stabling point was instead referred to as ‘’Ewer Street’’, after the road which ran from north to south alongside the site’s eastern elevation. The 1901 opening of Ewer Street equipped the ex-SER London termini with a plethora of turntables; Belvedere Road, on the South Bank, served Charing Cross; Cannon Street was served by no less than two turntables at Stoney Street Junction (again, south of the river: one of these turntables fed a five-road semi-roundhouse); and, of course, rotation facilities were not far down the line at Bricklayers Arms. Ewer Street acted as a useful alternative to Bricklayers Arms, in the capacity of rotating engines and topping up coal and water supplies. It avoided the need for many light engine movements between the termini and the principle suburban shed of the ex-SER lines, which would otherwise have blocked paths of scheduled services. The swift electrification of ex-SE&CR suburban lines under Southern Railway auspices resulted in the abolition of many steam locomotive facilities. On 28th February 1926, scheduled electric services commenced between the ex-SER London termini and Orpington, the latter at which the marginally earlier third rail, brought round from Bickley Junction in 1925, was met. The 50-foot 2-inch turntable at Belvedere Road was removed, and a short stub siding laid in its place. Closure was brought to Cannon Street shed, and its associated turntable was removed. However, the second turntable, which lied to the west of the Cannon Street approach tracks at Stoney Street Junction (which itself was removed during layout alterations), was retained, along with the stabling point at Ewer Street. About a decade later, the SR upgraded the arrangement at the latter, the most notable additions being a water column and a cylindrical water softener, to tackle the hard, chalky water associated with the Eastern Section lines. The Kent Coast Electrification period of the British Railways era brought many changes to the infrastructure arrangement described. In October 1960, a huge depot, purpose-built to handle continental traffic, was commissioned at Hither Green. This was positioned alongside the ‘’up’’ tracks from Orpington, to the south of the station. Thereafter, Southwark Depot ceased to function in this capacity, but the site and buildings here remained in use to handle parcels traffic. In the meantime, electrification of the Eastern Section’s main lines also signalled the end for the diminutive Ewer Street Depot. The full accelerated electric timetable came into use on the ex-SER main line on 18th June 1962, but Ewer Street had served its last locomotive the previous year – steam-hauled services from Charing Cross and Cannon Street had all but disappeared. Steam locomotive numbers from the former had already been hit hard in 1958, on the commencement of diesel services to Hastings. Bricklayers Arms lingered on as a steam depot for just a year after the closure of Ewer Street, the former providing traction for freight services until the end. In 1969, Southwark Depot ceased handling parcels traffic. Afterwards, electrified sidings were laid on the site to stable passenger stock during the peak periods. 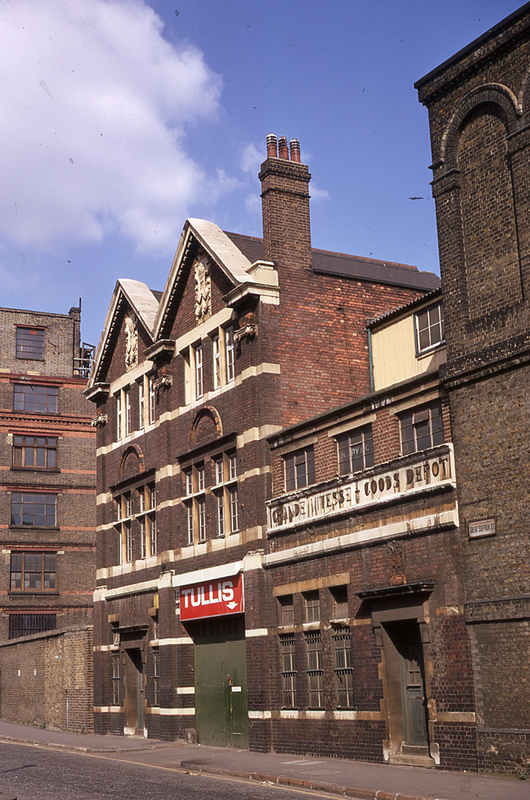 For this later role, the depot became known as "Southwark Sidings" and rails to store rolling stock were also laid upon Blackfriars Bridge at this time. 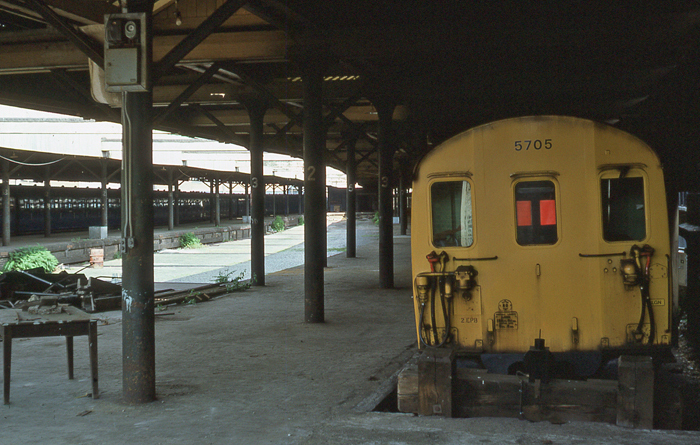 A decline in commuter traffic levels in the early 1980s generated surplus rolling stock storage space and, as a result, Southwark Sidings were decommissioned in May 1983. Thereafter, the former continental and steam depot sites were used partly as an open-air car park and partly as a store for the permanent way department. This remained the situation until 2004, when the area became host to four-storeys worth of prefabricated mobile offices belonging to infrastructure owners "Network Rail".